It's in the news on a near-weekly basis. Research studies address various aspects of it. National organizations and expert panels issue recommendations on it. Your patients are probably asking about it at an increasing rate. "It" is cholesterol. How much do you know about the complexities of cholesterol? Can you answer your patients' questions accurately, and provide them with appropriate recommendations? What you tell them is vital to their lifelong health: According to the American Heart Association (AHA), an estimated 70 million Americans suffer from one or more forms of cardiovascular disease (CVD). These diseases claimed 927,448 lives in the U.S. in 2002 - more than the total lives claimed by cancer, accidents, and HIV combined. And in case you view CVD as a condition exclusive to the elderly population, take note that more than 150,000 of those killed by CVD in 2002 were under the age of 65. Cholesterol is a soft, wax-like lipid that occurs naturally in the bloodstream and in cell walls and membranes. It is a normal and important part of a healthy body, because of the essential role it plays in cell membrane, hormone, and vitamin D production, and the digestive process. First, a little background: Dietary fat is absorbed by the intestine and transported to the liver. The liver then converts fat into cholesterol and releases it into the bloodstream. Because cholesterol isn't water-soluble, cholesterol and triglycerides (a blood lipid) combine with proteins to form lipoproteins, which then transport cholesterol through the watery blood system. Low-density lipoprotein (LDL) and high-density lipoprotein (HDL) are the two main types of lipoproteins; they differ markedly from one another in their ratio of cholesterol and triglycerides to protein, and thus, in their effect on blood levels of cholesterol. LDL cholesterol: LDLs carry a great deal of cholesterol, because they help transport it from the liver to the rest of the body. Too much LDL cholesterol circulating in the blood can cause buildup on the inner walls of the arteries that feed the heart and brain. Over time, LDL cholesterol can contribute to the formation of plaque - a thick, hard deposit that clogs arteries, resulting in atherosclerosis. As arteries narrow, the oxygen supply to the heart is gradually compromised, and the risk for a heart attack grows. HDL cholesterol: HDLs carry relatively little cholesterol - they actually circulate in the bloodstream, helping remove excess cholesterol from blood and tissues. Specifically, evidence suggests that HDLs tend to carry cholesterol away from the arteries and back to the liver, where it is then eliminated from the body; and that HDLs also remove excess cholesterol from plaque in the arteries, resulting in a slower potential buildup of plaque. Triglycerides transport and store fat in the body. It's clear that high triglyceride levels aren't good for the body, and can be particularly problematic when combined with excess levels of LDL cholesterol. People with high triglycerides often have high total cholesterol, high LDL cholesterol, and low HDL cholesterol. And some lipoproteins are rich in triglycerides that also contain cholesterol. 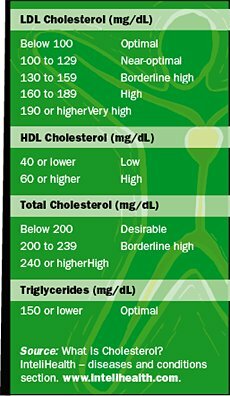 The National Cholesterol Education Program, developed by the National Heart, Lung and Blood Institute of the National Institutes of Health, has set the "safe" total cholesterol level at 200 mg/dL. A score of 200 or higher signifies increased risk for developing heart disease; over 240 puts the patient in the high-risk category. An LDL cholesterol level of less than 130 mg/dL is acceptable for most people; less than 100 mg/dL is ideal. The desirable level of LDL cholesterol depends on whether an individual has risk factors for coronary artery disease, or a pre-existing health condition caused by atherosclerosis or diabetes. The AHA and the American Diabetes Association currently recommend HDL levels of at least 40 mg/dL for men and at least 50 mg/dL for women. A blood level of 60 mg/dL or above is ideal. The HDL:LDL ratio is crucial - perhaps more so than the total cholesterol score. For example, a patient with a total cholesterol score of less than 200 mg/dL could still be at risk for developing cholesterol-related atherosclerosis - if his or her LDL level constitutes a large percentage of that score. By comparison, a patient whose total cholesterol is higher than 200 mg/dL may actually be at less risk, if his or her HDL score is high. The ideal ratio of total cholesterol to HDL cholesterol is 3.5:1. The Coronary Primary Prevention Trial (1984) demonstrated that reducing total and LDL cholesterol levels significantly reduced the incidence of CHD; more recent investigations have affirmed this association. Dietary habits play a major role in determining your total blood cholesterol level, as well as the relative distribution of HDL and LDL cholesterol. Consumption of foods high in saturated fat and LDL cholesterol are a major reason for out-of-control cholesterol levels and rising heart attack rates in the United States. All foods that contain fat have different distributions of saturated and unsaturated fats. Saturated fat is found primarily in foods that come from animals - red meat (particularly fatty cuts), poultry with the skin on, whole-milk dairy products (whole milk, butter, cheese, ice cream), and tropical oils (coconut, palm kernel, etc.). Consumption of saturated fat increases LDL and total cholesterol in the bloodstream. On the other hand, unsaturated fats do just the opposite: They increase HDL cholesterol and reduce LDL cholesterol and triglycerides. Good sources of monounsaturated fat are canola, peanut and olive oil; olives; avocados; and most nuts. Polyunsaturated fat can be found in corn, soybean, safflower, and cottonseed oils, as well as in fish. And let's not forget omega-3 fatty acids, a type of polyunsaturated fat. Evidence suggests omega-3s, good sources of which are fatty fish, such as mackerel, salmon, sardines, or swordfish, may help prevent heart disease. That's one reason why the American Heart Association currently recommends that everyone eat at least two servings of fish on a weekly basis. Trans fats are liquid vegetable oils that are transformed via hydrogenation into solids at room temperature. This chemical process transforms healthy vegetable oils into unhealthy fats that have been shown to raise LDL cholesterol. In today's world of processed foods, more and more non-animal products contain hydrogenated fats/oils, a source of trans fats - which actually cause your body to make more cholesterol. Foods that contain trans fats include margarines, vegetable shortening, partially hydrogenated vegetable oil, countless fast foods (especially French fries), and most commercial baked goods (crackers, donuts, potato chips, etc.). The good news, if there is any, regarding trans fats is that as of 2006, the Food and Drug Administration is requiring that food manufacturers list amounts of trans fats on the nutrition information labels of products. The egg is perhaps the ultimate cholesterol question mark. On the one hand, eggs are a great source of important nutrients, including vitamin D, vitamin B12, riboflavin and folate, that may help reduce the risk of heart disease. They also provide high levels of protein, iron and phosphorus. But studies conducted at Harvard University found that people who ate one egg per day were actually no more likely to develop heart disease or suffer a stroke than people who ate one egg per week or less. The egg yolk contains all the cholesterol (and fat), so limiting consumption of egg yolks (to no more than four per week, according to the AHA's current recommendation), and products that contain egg yolks, may be an important aspect of managing cholesterol. Moderation is probably the best message to share with your patients, whether it's eggs or any other food that can affect cholesterol. Helping your patients find a healthy balance of diet, exercise, weight management and stress reduction are vital steps in winning the battle against high cholesterol. Cholesterol. The American Heart Association (www.americanheart.org). Diseases and Conditions: Cholesterol. www.intelihealth.com. The National Cholesterol Education Program. Information available online at www.nhlbi.nih.gov. Fats & Cholesterol. Harvard School of Public Health. www.hsph.harvard.edu/nutritionsource/fats.html. The many benefits of boosting HDL. The John Hopkins Medical Newsletter, June 2005. High Cholesterol. In: Baltch JF, Baltch PA. Prescription for Nutritional Healing, 2nd edition. Avery Publishing Group: Garden City, New York, 1997. Cholesterol in Your Body. North Central Regional Extension Publication 332 - U.S. Department of Agriculture, Washington, D.C.
Bird, Patrick J. Eggs and Cholesterol. University of Florida College of Health and Human Performance.